Samsung is aiming to be a dominant player in the Internet of Things (IoT) space, and the company is positioned well to reach that goal. It acquired the IoT start-up SmartThings in 2014 for a reported $200 million to strengthen its portfolio in the smart home category. Eventually, SmartThings turned into Samsung’s umbrella-brand for all its IoT products and services. SmartThings used to operate an online store for all its products, and Samsung kept it running even after the acquisition. The company has now decided to shut it down and migrate to the Samsung website. 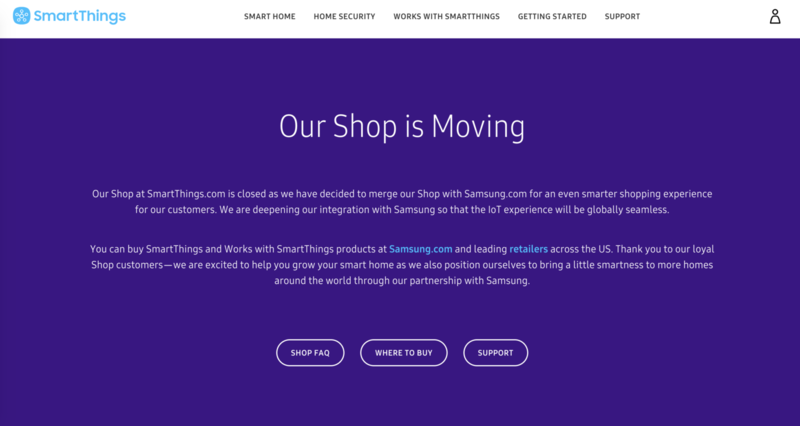 Samsung’s online store sells the entire range of the company’s products, and so it makes sense to move the SmartThings portfolio to its one-stop shop. Warranty and returns for the products purchased on the SmartThings shop will not be impacted by this change. The SmartThings team will also take care of any unused store credit associated with your account. The move changes nothing for the customers except where they buy their new SmartThings products going forward. Customers can now buy the entire range of SmartThings products under the ‘Appliances & Smart Home’ section on the Samsung website. The products will also continue to be available with all major online and offline retailers such as Amazon, Best Buy, Home Depot, Newegg, etc. Samsung is currently selling SmartThings Hub and Sensors, SmartThings Wi-Fi, and SmartThings Tracker on its website. The company doesn’t seem to be selling any third-party Works with SmartThings products from Philips, Ring, Honeywell, etc., and we don’t if know Samsung intends to do so in the future.